The prevention by six reversible and selective monoamine oxidase-A (MAO-A) inhibitors (α-ethyltryptamine, harmaline, 4-methoxyamphetamine, amiflamine [FLA 336(+)], N-desmethylamiflamine [FLA 788(+)] and N,N-desmethylamiflamine [FLA 668(+)] of the phenelzineinduced irreversible MAO inhibition in the rat brain was examined. By using crude synaptosome preparations of hypothalamus and striatum incubated with low substrate concentrations of 14C-serotonin (1×10−7 M), 14C-noradrenaline (2.5×10−7 M) and 14C-dopamine (2.5×10−7 M) in the absence and presence of selective amine uptake inhibitors (alaproclate, maprotiline and amfonelic acid, respectively), it was possible to determine the deaminating activities inside and outside the specific aminergic synaptosomes. Thus, with this technique the protection of MAO by the reversible inhibitors administered orally 1 h prior to the subcutaneous injection of phenelzine against the phenelzine effect could be determined inside and outside the specific aminergic neurons. It was found that α-ethyltryptamine, 4-methoxyamphetamine and particularly amiflamine and FLA 788(+) were more potent inside than outside the serotonergic neurons. FLA668(+) was a selective inhibitor of noradrenergic MAO, to which also 4-methoxyamphetamine, amiflamine and FLA 788(+), but not α-ethyltryptamine had some preference. Harmaline had no certain preference for MAO in any of the aminergic neurons. At high doses of FLA 668(+) a preference for dopaminergic MAO was observed. 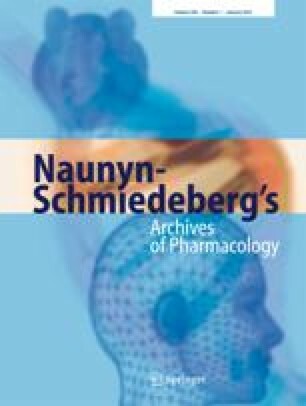 Since pretreatment of the rats with norzimeldine or desipramine antagonized the preferences for serotonergic or noradrenergic MAO, it is plausible to conclude that the compounds showing these preferences are accumulated in the neurons by the membranal uptake systems.